Peak Energy: Climate Skeptics To Sink Through The Disappearing Sea Ice ? Hi, thank you for this excellent post ! 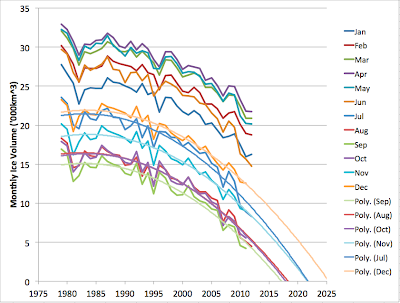 A question : I don't see how this graph is related to the one in your former post here http://peakenergy.blogspot.fr/2012/08/why-arctic-sea-ice-death-spiral-matters.html. If I look at the months march and april, on the former, they were not the lowest of oll years, instead of what I read on this latter chart. Sorry I posted the same comment several times because I couldn't make it though the anti robot proof !!! I can't explain the inconsistency between the 2 graphs - different data sets perhaps ?